Mahabharata story: Durvasa Muni and cooking pot of Draupadi! Once Durvasa Muni visited the house of Duryodhana, the enemy cousin of Maharaja Yudishtra. Duryodhana was intelligent enough to satisfy the brahmana by all means, and the great rishi wanted to give some benediction to Duryodhana. and thus he designed to engage the brahmana to show his wrath upon his enemy cousins, the Pandavas. who was the eldest and chief among all his cousins. 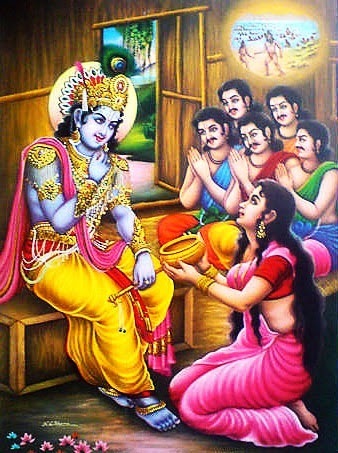 But by his request he would go to him after he had finished his meals with his Queen, Draupati. number of brahmana guests, and thus the rishi would be annoyed and would create some trouble for his cousin Maharaja Yudishtra. That was the plan of Duryodhana. after the King and Draupadi had finished their meals. rites in the river, for by that time the foodstuff would be prepared. of Duryodhana, reached there after Draupadi had finished her meals. of Lord Krishna in that dangerous position and the all-pervading Lord could at once know the dangerous position of His devotees. He therefore came there on the scene and asked Draupadi to give whatever food she might have in her stock. On her being so requested by the Lord, Draupadi was sorrowful because the Supreme Lord asked her for some food and she was unable to supply it at that time. already taken her meals, and thus they were in danger. By expressing her difficulties she began to cry before the Lord as only a woman would do in such a position. the Lord found some particle of vegetable sticking to the pot. The Lord at once picked it up and ate it. After doing so, the Lord asked Draupadi to call for her guests, the company of Durvasa. But the brahmanas, because of Lord Krisha’s accepting a little particle of food, felt sumptuously fed, even while they were in the water. eat, the King would feel very sorry, so it was better not to go there. Thus they decided to go away. This incident proves that the Lord is the greatest mystic, and therefore He is known as Yogeswara. satisfied because of the Lord’s being satisfied. That is the way of devotional service. PS: I humbly request all the devotees to please forward and share this moral / instructive stories they hear so that everyone can be benefited by hearing about Krishna and his dear devotees.